Ratings — 1, 2 and 3 Hr. 1. Steel Column — Min sizes of W-shaped and tubular steel columns which appear in the AISC Steel Construction Manual as shown under Item 2. 2A. Gypsum Board* — As an alternate to Item 2- 3/4 in. thick gypsum wallboard. For 2 Hr rating, 1-1/2 in. total thickness, installed in accordance with corner detail B. For 3 Hr rating, 2-1/4 in. total thickness installed in accordance with corner detail C. Boards are to be applied vertically without horizontal joints. 2C. 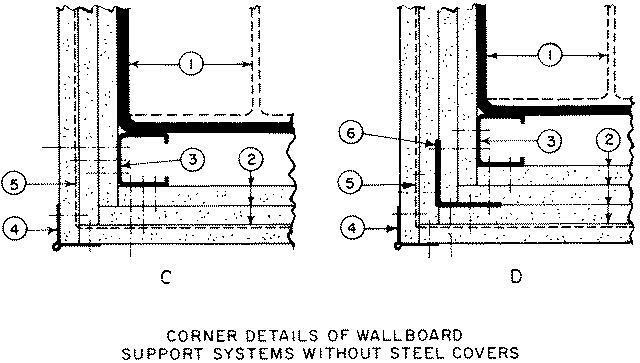 Wall and Partition Facings and Accessories* — (As an alternate to Item 2 through 2B) — Composite Gypsum Panel — Nominal 5/8 in. thick panels. One of the layers of Gypsum Board (Item 2) used to obtain the minimum required thickness in Item 2 may be substituted with one layer of composite gypsum panel and secured as described in Item 2. 3. Steel Stud — 1-5/8 in. wide with 1-5/16 and 1-7/16 in. legs having a 1/4- in. folded flange, fabricated from No. 25 MSG galv steel. Length to be 1/2 in. less than the assembly height. 3A. As an alternate to Item 3 Steel Framing Members* — galv. steel clips spaced 4 ft OC and 1-1/4 in. from top and bottem of column. A No. 28 MSG galv steel support angle with 1-1/4 in. length shall be placed over clips and secured with screws attaching the wallboard. The angle cut 1 in. less than assembly height splices in angle to occur over clips. The clips for use with wide flange columns only. 4. Corner Beads — No. 28 MSG galv steel, 1-1/4 in. legs to be attached to the wallboard with No. 6 by 1 in. screws spaced 12 in. OC max. 5. Tie Wire — No. 18 SWG steel wire spaced 24 in. OC used with second layer of wallboard. 7. Finishing System — (Not Shown) — Joint compound applied over corner beads to a thickness of 1/16 in.